Duba April 9, 2011 – Ahmed Mansoor, Human Rights Activist and Blogger from the United Arab Emirates , was taken from his apartment in Dubai on Friday April 8, 2011 afternoon, he has not been heard from since he was taken from his Dubai apartment Friday, his wife said. CNN report that Lt. General Dhahi Khalfan Tamim, the commander-in-chief of Dubai police, said he was not aware whether Mansoor had been arrested, but promised to look into it. I would like to inform you all that I’m facing an unprecedented campaign against me, the result, until yesterday, before the middle of the night, six clear and direct death threats with their real names, phone numbers and some were using their real photos in their facebook profile. They were all UAE citizens and belong to the tribe called ”Al Mazrouei”. The Campaigns and the outrageous insults against me by some individuals were posted in the blogs, Twitter, Facebook and BlackBerry. All this campaign came after we posted the petition dircted to the head of state and rulers of the Emirates calling for reform in the FNC (the parliament) to extend legislative and regulatory power to it, and after our appearance in some media channels talking about these demands, revolutions in the region, and implications the sensitive time in the region. The strange matter is that most of those who death threatened me declared their full names, phone numbers and some were using their real photos apparently in their facebook profile! additionally, Etisalat (the Teleocom provider), which owns the largest share in my company that I work for (Thuraya Teleocm. Comp.) decided suddenly that they need to move Ahmed Masnoor, to work in their group subsidiary in Paksitan. Although I have no relation with Etisalat whatsoever and my contract is directly with Thuraya and Thuraya does not have an office in Pakistan or elsewhere other than UAE. I still do not understand under what legal stand does Etisalat order Thuraya to take this action. Management in my company (Chief Human Resource Officer first, then CEO the same day – yesterday, 6 April 2011) told me that the matter is not in their hand and they have no control over it. There was no doubt in my mind that the matter was an order from the State Security to find a mechanism to get rid of me. They would get rid of me in all cases in a politically correct way, if I accept, I go to Pakistan, if I don’t I will be fired. I certainly refused to go to Pakistan regardless of the offer. I certainly refused to go to Pakistan regardless of the offer. I never signed a contract with Etisalat, and my contract is directly with Thuraya. I never signed a contract with Etisalat, and my contract is directly with Thuraya. The management of my company was professional and friendly and appreciating to my work, they dealt with me on that basis, it was beyond their hands. Thought they did not state it, it was clear to all of us that this came from the State Security due to my activism in Human Rights, demand for political reform and late appearance in many TV shows. I expect that they will soon send me termination letter as I refused to go to Pakistan. I expect that they will soon send me termination letter as I refused to go to Pakistan. Just wanted to keep you in the picture. Just wanted to keep you in the picture. The Internet, especially the Facebook, Twitter and online discussion forums, has been witnessing an unprecedented attack from some Internet users on activists, noticeably after the revolution of Egypt. The Internet, especially the Facebook, Twitter and online discussion forums, has been witnessing an unprecedented attack from some Internet users on activists, noticeably after the revolution of Egypt. Attacks however peaked after the reach of protests to Oman and Bahrain. 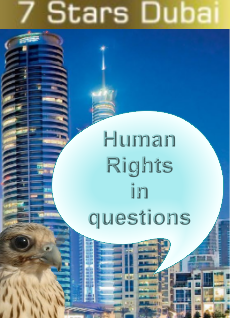 Attacks however peaked after the reach of protests to Oman and Bahrain. Internet Thugs have been using verbal abuses and insults, threats of physical harm, and recently distributed a electronic circular describing activists as traitors and posting their photos around a gallows (see link below), in a Simi-replica of the scenario that accused Bahraini activist of coup plot. 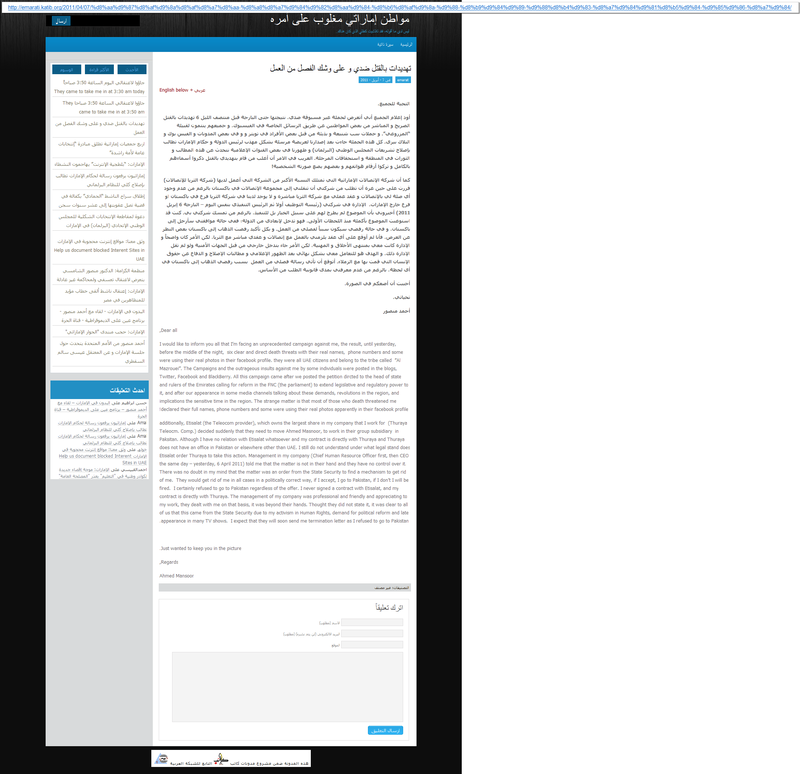 Internet Thugs have been using verbal abuses and insults, threats of physical harm, and recently distributed a electronic circular describing activists as traitors and posting their photos around a gallows (see link below), in a Simi-replica of the scenario that accused Bahraini activist of coup plot. Some activists believe that these thugs may belong to security agencies; as UAE usually, and quickly, block such Internet sites, while no action has been taken so far towards these thugs so far, especially that many UAE laws criminalize such acts. Some activists believe that these thugs may belong to security agencies; as UAE usually, and quickly, block such Internet sites, while no action has been taken so far towards these thugs so far, especially that many UAE laws criminalize such acts. Some activists whom their photos appeared in the electronic circular hold the security authorities responsible for their personal security and request them to stop the systematic abuse against them. Some activists whom their photos appeared in the electronic circular hold the security authorities responsible for their personal security and request them to stop the systematic abuse against them. Internet penetration in UAE is one of the most in the Arab world compared to number of the population, opposition and dissents sites however are usually blocked quickly. Internet penetration in UAE is one of the most in the Arab world compared to number of the population, opposition and dissents sites however are usually blocked quickly. Reports have also indicated the targeting and harassments of Internet activists by the State Security. Reports have also indicated the targeting and harassments of Internet activists by the State Security. DUBAI, United Arab Emirates — Authorities in the United Arab Emirates detained a blogger and rights activist who had said he’s gotten death threats for calling for political freedoms and an elected parliament in the Gulf nation. Ahmed Mansour was detained Friday at his home in Dubai, his wife and a colleague told The Associated Press. Mansour’s wife, Nadia, said 10 policemen – some wearing civilian clothes – searched their house for three hours before taking her husband into custody and seizing two laptops and several documents. “They were calm and polite, but they did not allow me to speak to my husband while they were in the house,” she said. A female officer was guarding her while others searched the house and questioned her husband. They refused to tell her where they were taking him, she said. 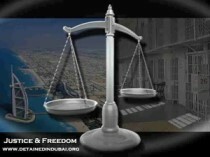 Another political activist and a prominent Emirati lawyer, Mohammed al-Mansouri, also reported the arrest. Police and government officials could not be reached for comment. 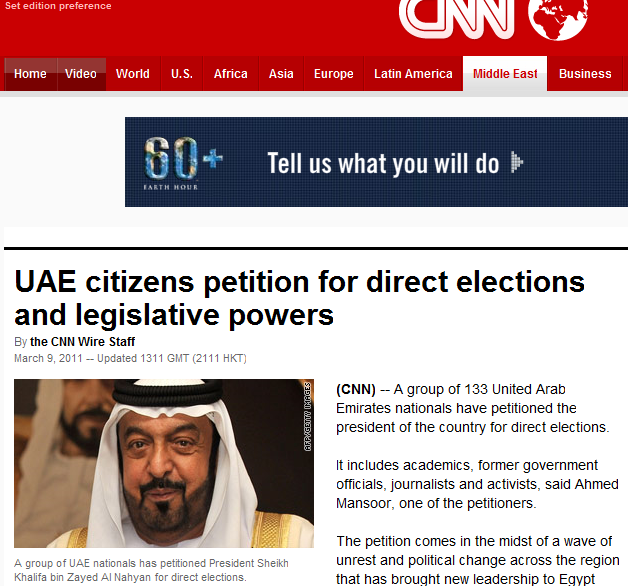 A group of 133 United Arab Emirates nationals have petitioned the president of the country for direct elections. It includes academics, former government officials, journalists and activists, said Ahmed Mansoor, one of the petitioners. The petition comes in the midst of a wave of unrest and political change across the region that has brought new leadership to Egypt and Tunisia. The petition is addressed to President Sheikh Khalifa bin Zayed Al Nahyan and the members of the Supreme Council of the seven Emirates that form the U.A.E. In addition to elections, the group is also asking that the Federal National Council be granted legislative powers. The body only works in an advisory capacity and has no regulatory powers.